It’s always heartening to wake up to a great new review of one of our apps. This time, a user in Spain (we’re guessing) has left us some lovely comments about FCE Academy Listening. Muy buena aplicacion para practicar los dificiles "listening" del First. Tras probarla me convencio comprar el resto de ejercicios. Puedes practicar sus diferentes ejercicios que salen en el examen. Tenia panico a los listenings y la tipologia de sus respuestas y gracias a esta Ap ahora los puedo afrontar con mas normalidad y sangre fria...el secreto es practicarlos una y otra vez... Agradezco mucho que haya este tipo de Apps para los que nos preparamos al First. Very good application to practice the difficult First Listening test. After trying the app, I decided to buy the rest of the exercises. You can practise all of the different exercises that you will encounter in the exam. I used to panic about the listening test, but thanks to this app I can now face them and keep my cool ... the secret is to practise them again and again ... I am very grateful that there are apps like this to help us prepare for the First. Replica exam-practice papers for home study and classroom exercises. We are proud to reveal the first four practice books in our Cambridge exams series, available to buy from Amazon and selected retailers. These editions of sample tests have been written to closely replicate the Cambridge-exam experience and have undergone rigorous expert and peer review. The content has been selected from the critically acclaimed FCE Academy, FCE Academy Listening and CAE Academy apps. Michael Macdonald qualified as a teacher in Cambridge and currently lives in Madrid, where he is Director of Studies for Prosperity English, an English-language teaching academy focused on preparing candidates for Cambridge examinations, such as the B2 First (FCE), C1 Advanced (CAE) and the Cambridge English C2 Proficiency (CPE). For more information, visit our books webpage. As we approach our 100,000th download, we will be giving away 100 apps. Over the next few weeks, we will randomly select 100 followers and will private message each person to ask which Academy app they’d like to receive. By following us on Facebook you will have access to regular English-language tips, free Cambridge exam Use of English and Listening resources, and occasional English-language learning articles of interest. You can read more about the Cambridge-exam materials we publish here. With 84,000+ downloads of our Academy apps to date, we are always pleased to receive positive reviews, but this one has really made our days. The user first reviewed their purchase last year, when they were preparing for the CAE. They’ve recently updated that 5-star review to let us know that they’ve passed their exam! We’re delighted for them … and pretty pleased with ourselves, too. You can read hundreds of glowing user reviews on our website, and read more about our critically acclaimed Cambridge-exam apps and books here. Are you an ELT teacher with a passion for creating new resources? Do you think you’ve got a book in you? Then get in touch. Prosperity Education is recruiting authors for 2019. Your book will be reviewed and edited by a professional team (45 years’ of combined publishing and teaching experience). We will design the text, create a compelling cover, and write blurbs. We will get your book onto Amazon as a print-on-demand title and (if it suits the format) an ebook for Kindle. We will advertise the book within Amazon and, if appropriate, Google Ads and Facebook. You will be able to buy author copies from us at cost (usually around €1.90) and sell them yourself at the price you choose. A whopping 50% net royalty rate, which we think is probably the best in the industry. For example, your book retails for €20 on Amazon. Amazon takes a royalty of 40% (€8) and maybe €3 to cover printing. Of the remainder, we pay you €4.50. We cover advertising costs out of our share. Most of all, you could be seeing your name on the cover of a book by the end of 2019. This is not vanity publishing. We don’t want any money from you - it’s your words that interest us. At the same time, we’re selective: we will only invest our time in a project we believe in. After three years in business, we have reached the point where we need to expand the range of titles we publish. This is where you come in! Luis Porras Wadley, director of the established KSE Academy in Granada, Spain, was recently interviewed by the Spanish newspaper El Pais and spoke most favourably about our B2 First app FCE Academy. “You have to dedicate at least 5 hours per week, preferably spread out over several days. Ensure you can avail of all possible stimulations: read listen and speak in all situations. You can read the full El Pais article here. Luis goes on, when discussing how best to prepare for the Use of English section of the Cambridge B2 First exam, to recommend the FCE Academy app. 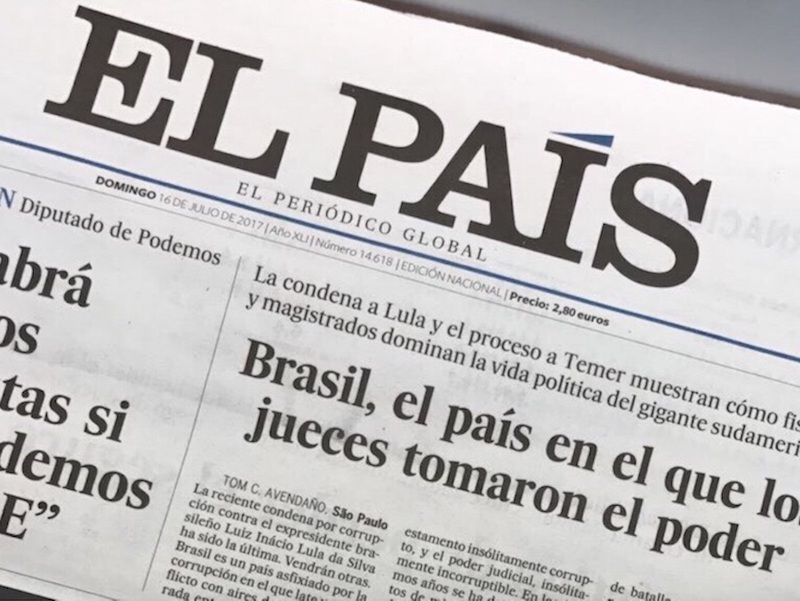 We’re enormously proud of this endorsement in a reputable newspaper such as El Pais, as it means the word is spreading. With 60,000 downloads made of our Academy apps to date, and great interest in our recently published, first print book, Cambridge B2 First: Use of English practice tests, we are feeling good about ourselves and all that we do. Visit our website to learn more about this. We are delighted to announce the publication of our first print book, available to buy from Amazon. In response to popular demand, this edition of sample tests has been produced to closely replicate the Cambridge exam experience, and has undergone rigorous expert and peer review. It comprises ten Use of English tests, 40 texts, 300 individual assessments with answer keys, write-in answer sheets and a marking scheme, providing a large bank of high-quality practice material for students preparing for the B2 First. The content, which comes from the FCE Academy and FCE Academy for schools apps, has been expertly written and reviewed independently by a Cambridge ESOL examiner. Author Michael Macdonald is Director of Studies for Prosperity English Madrid, an English-language teaching academy focused on preparing candidates of Cambridge examinations, such as the B2 First (FCE), C1 Advanced (CAE) and the Cambridge English C2 Proficiency (CPE). View the product page for more information. If you'd like us to help us pass your CAE, you can try our app for free at Google Play or iTunes. Answer in the comments: A winner will be selected at random to receive a free FCE Academy app (worth €10). Many congratulations to Hạt Dẻ, the winner of last week's pop quiz and humbled recipient of a complete FCE Academy (B2 First) app. Hot on the heels of our latest mobile app, FCE Academy Listening, we are pleased to announce the imminent publication of our first book, a printable teacher's resource containing loads of Cambridge B2 First Use of English practice tests. 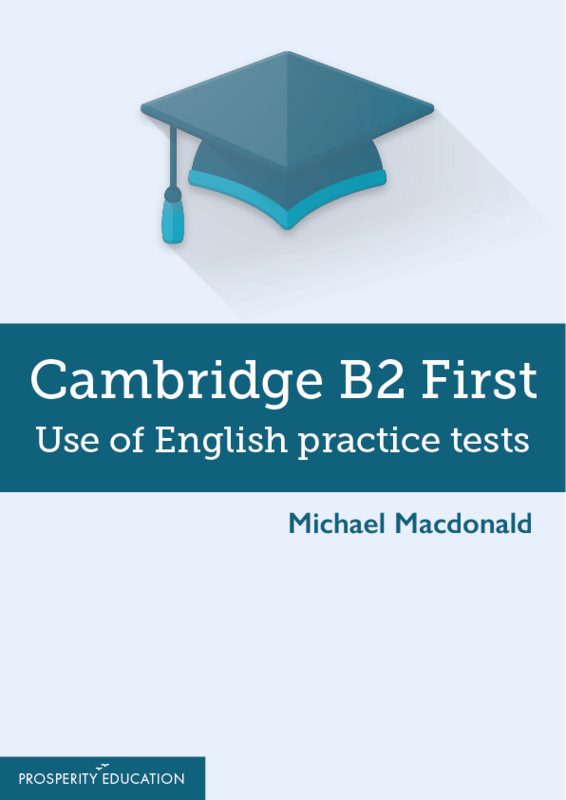 Written by the Academy author, Michael Macdonald, the resource features ten complete exams (360 assessments) covering Parts 1, 2, 3 and 4 of the Cambridge B2 First (FCE) exam. The tests closely match the Cambridge exam, both in presentation and the quality of the assessment content, and are accompanied by answer keys and mark schemes. Here's a spread from the latest page proofs. Read our user reviews here. Free Lite apps available on Google Play and the App Store. 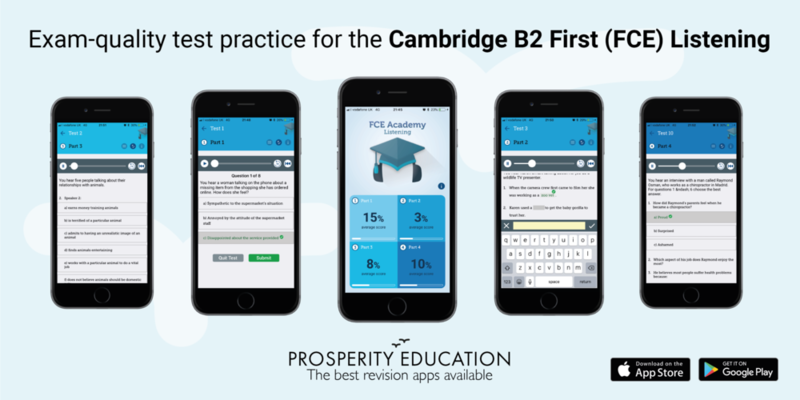 The new Cambridge English B2 First (FCE) Listening app from Prosperity Education, purveyors of world-class English Language revision apps, available now on Google Play and the AppStore. Download the FREE Lite version and give it a try! Ahead of official publication of FCE Academy Listening, we are pleased to invite Android users to download the new app directly from our website, availing of a 10% discount in the process. To do this, visit our Shop page. The team over at Cambridge Assessment English has unveiled the new titles for their range of exams. As you can see from the list below, the main difference is that they have added the CEFR level. The Common European Framework of Reference for Languages (CEFR) is a way of describing language ability in six steps, from A1 for complete beginners to C2, which describes someone who has mastered the language. So what does this mean for our apps FCE Academy and CAE Academy? Do we rebrand straight away, or do we keep the old name for the time being because this is what people will be searching for? Two weeks ago we wrote about getting our new app, FCE Academy Listening, into development. Well, the team have been working hard and we're now ready to share the (almost) final screens of our Android app. The app for iOS comes next. As soon as we launch, we'll be giving out free codes in order to get as many reviews as we can. Why not sign up now? Yes, I'd love to get 10 complete FCE-style audio tests for free. Plenty to do! Every time we work on an app, we get surprised all over again at how much time it all takes. We may have been a bit quiet on the blog front of late, but fear not: the lights are still on at Prosperity Education. After launching FCE for Schools late last year, we decided our new challenge would be to publish an app to support FCE listening. And as of yesterday, it's all systems go! We have an audio producer lined up, a specification written for our trusty software engineer Pavel, and now our author Mike Macdonald is writing our scripts. We look forward to you tuning in!